Go 4.6 miles from the Pacific Coast Highway on Sunset Boulevard. Drive north into Will Rogers State Historic Park. If we come by RTD bus, get off at the Evans Rd stop on Sunset Blvd. A trail leads into the Park. This hike combines exercise with a bit of nostalgia. 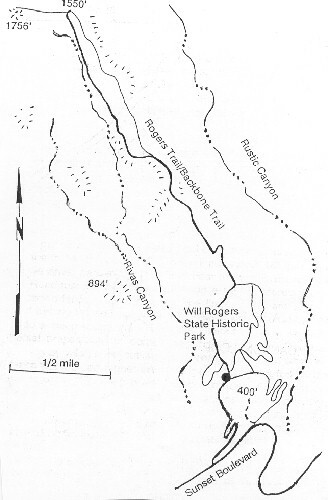 Will Rogers bought the ranch in 1922 and it became a state park in 1944. The house and grounds are preserved as they were. Although Will was astride a horse when he traveled these trails I believe no one had a closer feel for this land. Hike north along the trail near the tennis courts west of Park Headquarters. The trail goes uphill onto the ridge overlooking Rivas Canyon and passes close to Inspiration Point, then forks left beginning a steady uphill climb. The trail is steep in places, and rocky. Shade is rare so wind and sun play an important part in our comfort. The ridge we are on separates Rustic Canyon on the east from Rivas Canyon on the west, as we go higher, the canyon views and the ocean scene are spectacular. The trail levels out comfortably on top with some slight up and down as we go from one little peak to another. A trail breaks right and goes to the floor of Rustic Canyon. Farther on, as we start up a slight rise, a trail angles off to the left into Rivas Canyon. Take this trail and follow along the east slope of the canyon. Staying on this road takes us to the head of Rivas Canyon and the saddle overlooking Rustic Canyon. This is the turnaround point of the hike. A 4-trunked Oak tree provides a sheltered spot to rest and relax. Rogers Road continues into Topanga State Park. We can return the way we came or come back on the Ridge Trail. To do this we go east and uphill to the ridge. Because the Ridge Trail is no longer maintained I do not recommend its use.